Bajji is my all time favorite tiffin item. This is basically an appetizer. But I usually make Bajji along with Sojji (!) - Kesari for evening tiffin. 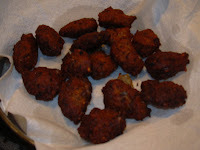 Here is the recipe for Bajji. First mix all the dry ingredients ( flour, salt, chillie powder, asafoetida powder, kesari color, baking soda)in a bowl, add water and prepare the bajji batter. The consistency should not be watery. Mix it with a whisk. 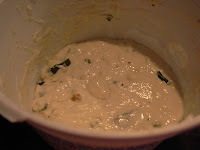 Mix it nicely until there are no lumps in the batter. 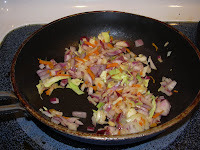 Now slice the vegetables and dip it in the batter. Fry it till golden brown in oil and serve it hot with some chutney. Take a wide pan, pre heat 3 tbsp oil, add mustard seeds, when it splutters, add urid dal, channa dal, fenugreek seeds, red chillies and asafoetida powder and fry these ingredient in low flame, to golden brown. Now add the sundakka vathal to it and fry it until it becomes crunchy. Now put the tamarind paste(if you are using tamarind, squeeze out the juice from it and pour it) and add 1 1/2 cup of water to the paste. Add turmeric powder, sambar powder and salt and let it cook for 10 mts. in medium flame. Now add the jaggery to it and again add 1/2 cup of water and let it boil for another 5 to 7 mts. In order to make the consistency thick, now mix the rice flour with a tbsp of water and pour it on top of the kozhambu and also pour the remaining oil. Let it boil for another 3 mts. Now Vatha kozhambu is ready to serve. Serve it hot with rice. Potato curry will be a good side dish for this rice. We can replace sundakkavathal with manathakkali vathal. This is something my mom used to make when I was a kid. Here is the recipe. 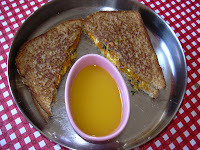 This is the regular grilled sandwich we make for kids with some extra addition. Here is the recipe. First take a pan, pre heat oil, put asafoetida powder, then add the vegetables one by one. 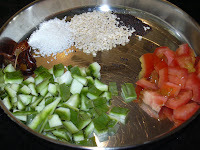 Add salt and green chillies and sprinkle a handful of water and let it cook for 7 to 10 mts. till all the vegetables become tender. Turn off the stove, when everything is mixed nicely and become tender. Now half-toast the bread slices. Spread butter on one side of each slice and spread the cooked vegetables to the required quantity. 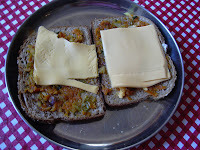 Now put the cheese singles on top of each bread slice & veggies and cover it. Now pre heat a pan, spread butter on the other side of both the bread slices and grill it under low flame. Enjoy with a cup of juice. 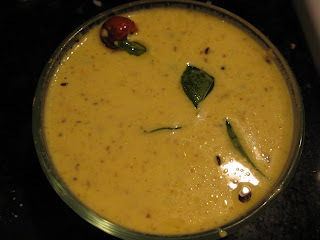 This is another rasam we make with buttermilk. Here is the recipe. Take a pan, put the chopped tomatoes in it, turmeric powder, rasam powder, salt and let it cook for 7 mts. When tomatoes is fully cooked, add the watery buttermilk to it and turn off the stove when foam forms. Take a small pan, pre heat oil, add mustard seeds, when it splutters add fenugreek seeds, curry leaves and asafotida powder an fry it golden brown. Pour it on top of rasam. Close it with a lid and serve it asfter 5 mts. In this rasam we can soak urad vadai and eat it as curd vadai. If necessary we can also add toor dhall water before adding buttermilk to the rasam. First pressure cook toor dhall with a pinch of turmeric powder and keep it aside. Take a small pan, pre heat oil, fry coriander seeds, fenugreek seeds, red chillies, asafoetida powder, channa dhall and coconut to golden brown and let it cool. Grind it into a fine paste. Keep it aside. Take a wide pan, put the vegetables, add required amount of water, turmeric powder and salt and let it cook till it becomes tender. Now add the coconut mixture and cooked toor dhall to it and let it boil for 5 mts. Now add the thick buttermilk to it and turn off the when the foam forms from it. This is more sambar. Take a small pan, pre heat oil, add mustard seeds, when it splutters, add fenugreek seeds, curry leaves and asafoetida powder and fry it till golden brown. Pour it on top of sambar. This is basically a snack item which is made out of the leftover Adai batter. The method is very very simple. Here is the recipe. First chop the onion finely and add it to the batter. Mix it nicely. 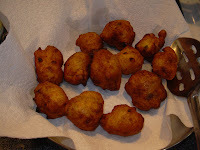 Pre heat the oil, make a small balls out of the batter and deep fry it until golden brown. It should come out nice and crispier. Tomato sauce can be a wonderful side dish. If we planning for a long drive, we can make these kunukku and take it to go with us for a little snack. 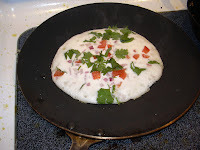 Pre-heat the dosa pan, pour the batter, sprinkle the tomato, onion and coriander leaves on top of it and pour one tsp of oil and let it cook for 3 mts. Flip it over and pour the remaining oil and let it slow cook for 3 more mts. Serve it hot with coconut chutney or sambar. The above said quantity of ingredients is enough for one big uthappam. 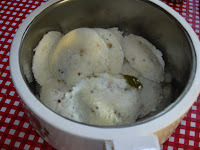 This is another method of making Idly Upma. Scramble idly and keep it aside. Take a pan, pre heat 1 tsp oil, add mustard seeds, when it splutters add urad dhall, asafoetida powder and fry it till golden brown. Add onion and sprinkle a hand full of water and let it become tender. Now add tomato sauce, salt and idly milagaipodi to it and let it mix thoroughly. Now add the scrambled idly to it. Mix everything well. Add or sprinkle a little water and mix it nicely. The given quantity is enough only for one person. Most of us know about this recipe which we make from the leftover idllies. Some people even make fresh idllies for making this upma. 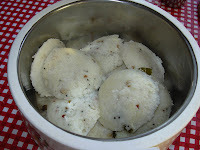 I usually make this idly with left over idly. Here is the recipe. Just scramble the idly into small pieces with hands. Add milagaipodi to it and mix it nicely. Finally add sesame oil to it and enjoy. I use nearly 3 tsp of milagaipodi for 3 idllies(!). I love spicy stuff. 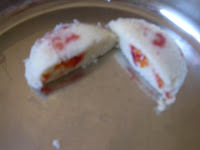 This is another variety of Bonda. 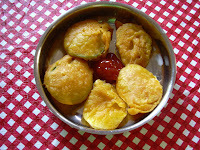 I made this bonda with left over idly batter. Here is the receipe. First cook the potato and mash it. Keep it aside. Take a pan, preheat the oil, add mustard seeds, when it splutters, add urid dhall, green chillies and fry it to golden brown. Add onion and fry it to golden brown. Now add the mashed potatoes and a quarter cup of water. Add turmeric powder and salt and let it cook for 3 to 5 mts. This is the masala. Make it thicker and not watery. Make it a small ball. 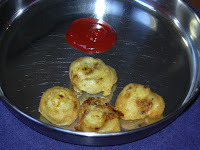 Take a wide pan, pre heat the oil, dip the masala balls into idly batter one by one and fry it to golden brown. Serve it hot with tomato sauce or coconut chutney. 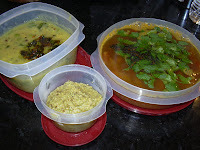 This is another sambar, my grandma used to make. Here is the recipe. First pressure cook toor dhall with a pinch of turmeric powder and keep it aside. Take a pan, pre heat oil, fry coriander seeds, coconut, red chillies and asafoetida powder to golden brown and grind it into a fine paste. Keep it aside. This recipe is more like regular sambar. First put the chopped mangoes, tamarind paste, Jaggery water, turmeric powder, sambar powder and salt and let it cook for 10 mts. Add the coconut paste to it and let it cook for another 3 mts. Now add the cooked toor dhall to it and let it mix with mango ingredients. 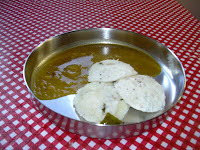 This is mango sambar. This can be eaten with rice. Preheat the oil, add mustard seeds, when it splutters add urid dhall, green chillies, asafoetida powder, curry leaves and cashew nuts to it and fry it till golden brown. Pour it into the batter. Mix it well. Add a pinch of salt if necessary. Now take the idly mould, spread some oil in it (preferably sesame oil) and pour the batter in the moulds and steam cook it for 15 to 18 mts. In order to see whether it is ready or not, use the back side of a spoon or knife or toothpick or match stick and insert it into the idly. It should come out clean when you take it, without any batter. This means the idly is ready to serve. Serve it hot with coconut chutney or mint chutney. On the day of making pooris, just fry the vadams to golden brown. 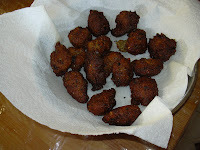 Take a wide cup, pour the milk, add sugar and cardamom powder to it and soak the fried vadams in it. Let it soak for3 mts. 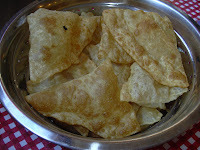 Now sabudhana sweet poori is ready to eat. Another popular dish of south Indians. Here is the receipe. First wash the rice and dry it. After it is fully dried, take that along with toor dhall and pepper and grind it coarsely. Now a take wide pan, pre heat both the oil, add mustard seeds, when it splutters add urid dhall, channa dhall, red chillies and asafoetida powder to it and fry it to golden brown. Now add 2 1/2 cups of water (i.e., add water in the ratio of 1 rice:2 1/2 water) and salt and bring it to boil. Now add coconut and rice mix (rice+toor dhall+pepper) to the boiling water and mix it thoroughly. Now close the pan with a lid and let it cook in a low flame for 10 mts. Open the lid and stir the upma occasionally. When the rice and dhall is fully cooked, turn off the stove. Coconut chutney will be a good side dish for this receipe. One of my favorite receipe. 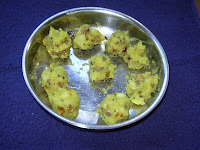 Here is the receipe..
For making masala - pressure cook potato and mash it. Now take a pan, pre heat the oil, add mustard seeds, when it splutters add urad dhall, channa dhal, cashew, green chillies and fry it till golden brown. Now add onions to it and cook it till golden brown. Now add the mashed potatoes to it with 3/4 cup of water, salt and turmeric power and let it boil for 5 mts. The consistency of the masala should be semi-solid . Garnish it with coriander leaves. 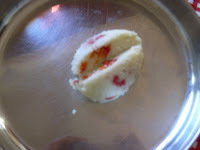 This is another way of making more kozhambu, the same procedure with some modifications. Here is the recipe. First soak the all the above given ingredients for soaking, to one hour. After an hour, add coconut to the ingredients and grind it into a fine paste. Keep it aside. Take a pan, put the chopped okra to it, add required amount of water, turmeric powder, salt and let it cook. When the vegetable becomes tender, add the coconut paste and add a little amount of water and let it cook nicely. when both mixed nicely, turn off the stove. Remove the pan from the stove top, add the thick buttermilk to it. Mix it well. This is more kozhambu. Now take a small pan, pre heat oil, add mustard seeds when it splutters, add fenugreek seeds, asafoetida powder and curry leaves and let it fry till golden brown. Pour it on top of more kozhambu. 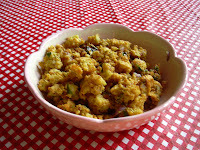 This can be a wonderful side dish for paruppu usli rice, variety rice and also with white rice. First, grind coconut, green chillies and cumin seeds, into a fine paste. Keep it aside. Take a pan, put the chopped taro root to it, add required amount of water, turmeric powder, salt and let it cook. 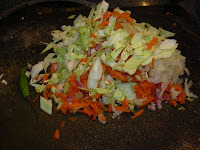 When the vegetable becomes tender, add the coconut paste and add a little amount of water and let it cook nicely. when both mixed nicely, turn off the stove. Remove the pan from the stove top, add the thick buttermilk to it. Mix it well. This is more kozhambu. Take a small pan, pre heat oil, add mustard seeds when it splutters add fenugreek seeds, asafoetida powder and curry leaves to it. Fry it till golden brown. Pour it on top of more kozhambu. This kootu can be made with some left over vegetables like beans, peas, carrot, chow chow, kholrabi, ridge gourd, wintermelon, pumpkin etc. Here is the recipe. Pressure cook moong dhall with a pinch of turmeric powder. Keep it aside. Grind coconut, green chillies and cumin into a fine paste. Keep it aside. Now take a wide pan, put all the vegetables, add turmeric powder, salt and required amount of water and let all the vegetables cook. When all the vegetables become tender, add the coconut paste to it and add a little water and let it cook for another 5 minutes. Now add the cooked moong dhall and let it all mix nicely and cook for another 5 mts. Turn off the stove. This is kootu. Take a small pan, pre heat oil, add mustard seeds, when it splutters add urad dhall, asafoetida powder and curry leaves and let it fry till golden brown and pour it on top of kootu. This is another simple recipe we make in my mother in law's place. Here is the recipe. First grind coconut+green chillies+cumin seeds into fine paste and keep it aside. Take a pan, put chopped tomatoes in it. Add turmeric powder, salt and required amount of water and let it cook for 7 mts. When tomatois 1/2 cooked, add the coconut paste to it and add little bit of water and let it cook for 5 to 7 mts. When the ingredients comes to required consistency, turn off the stove. Take a small pan, pre heat oil, add mustard seeds, when it splutters add urad dhall and asafoetida powder and pour it on top of kootu. Garnish it with coriander leaves. This is the quickest recipe one can make as a side dish for rotis. Here is the recipe. This is another kootu we make with channa dhal and peanuts. I like this kootu very much because peanuts very much. Here is the recipe. First pressure cook channa dhall with required amount of water and a pinch of turmeric powder. Do not over cook. It needs to be 1/2 cooked. Take a small pan, pour a drop of oil, fry urad dhall, red chillies, pepper, cumin and coconut to golden brown and let it cool. Grind it into a fine paste. Now take a pan, put the brinjal pieces and peanuts, add turmeric powder and salt and let it cook for 7 to 10 mts. When it is 1/2 cooked, add the pressure cooked channa dhall to it and also add the coconut paste and let everything cook for another 5 to 7 mts. A nice aroma of coconut, peanuts and pepper will come out of the kootu. Now turn off the stove. Take a small pan, pre heat remaining oil, add mustard seeds, when it splutters add urad dhall, red chillies, curry leaves and asafoetida powder and let it fry till golden brown. Pour it on top of kootu. Now kootu is ready to serve. This can be eaten with rice as a main dish or as a side dish with dosa, chapathi. I like eating brinjal or eggplant in the form of kootu instead of eggplant curry. This is one way of making brinjal kootu and my MIL is an expert in making this kootu. Here is the recipe. First pressure cook moong dhall with a pinch of tumeric powder and keep it aside. Take a pan, pre heat a drop of oil, fry urad dhall, channa dhall, red chilles, pepper and cumin into golden brown. Turn off the stove, add coconut and saute for a minute. Grind it into a fine paste. Keep it aside. Now take a pan, put the brinjal pieces, add required amount of water (don't add too mcuh water), turmeric powder and salt and let the brinjal for 7 to 10 mts. When it is 1/2 cooked, add the coconut paste to it and let it cook for another 3 mts. Now add the cooked moong dhall to it and let everything cook for another 5 mts. Add water if necessary. This is poricha kootu. Now take a small pan, pre heat oil, add mustard seeds, when it splutters add urad dhall, asafoetida powder and curry leaves and let it fry till golden brown. Pour it on top of kootu. Now kootu is ready to serve. This can be eaten with rice, as a side dish for chapathi or roti. This is another kootu we can make. Here is the recipe. 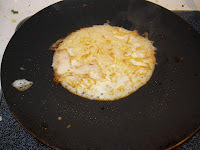 First take a small pan, pre heat it with a drop of oil, fry the above said ingredients from 4 to 9, to golden brown. Let it cool and grind it into a fine paste. Cook the vegetables with required amount of water, salt and a pinch of turmeric powder. When it becomes tender, add the coconut paste to it and let it cook for another 7 mts. Add some more water if necessary. Take a small pan, pre heat oil, add mustard seeds, when it splutters,add urad dhall, asafoetida powder and curry leaves and fry it to golden brown and pour it on top of kootu. Now kootu is ready to eat. Last week was a long week for me. I had to do the preparations for my girls' 4th birthday party on saturday. I had 0% strength to cook on sunday morning. Since my father-in-law is with us now, I had no choice other than to cook. I had ridge gourd in my fridge. So thought of doing ridge gourd kootu and thogayal with ridge gourd skin. So here is the recipe for thogayal. Take a small pan, pre heat a drop of oil, add mustard seeds when it splutters add channa dhall , asafoetida, coconut and red chillies and fry it till golden brown. Keep it aside. Now in the same pan, put the chopped onion, ridge gourd and saute for 5 mts. Let it become tender. Now put it on top of the fried lentils. Let everything cool. when it is ready for grinding, add required amount of salt and the tamarind piece and grind it into a fine paste or grind it coarsely (depending upon your taste). Now ridge gourd thogayal is ready to eat. Mix one tbsp of thogayal with rice add 1 tbsp sesame oil and mix with well and enjoy. 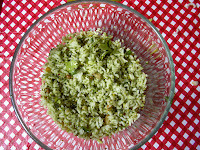 Ridge gourd kootu can be a wonderful side dish for this thogayal rice.